May I introduce you to one of Spitalfields’ most popular residents, Itchy, the black and white sow at the City Farm in Buxton St? 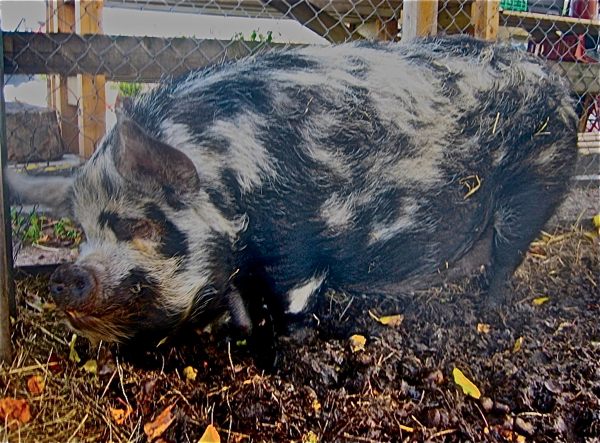 Itchy is an official registered Kune-Kune pig, hailing from New Zealand where in the nineteen seventies her breed came close to extinction. She is proudly descended from just eighteen hardy survivors. 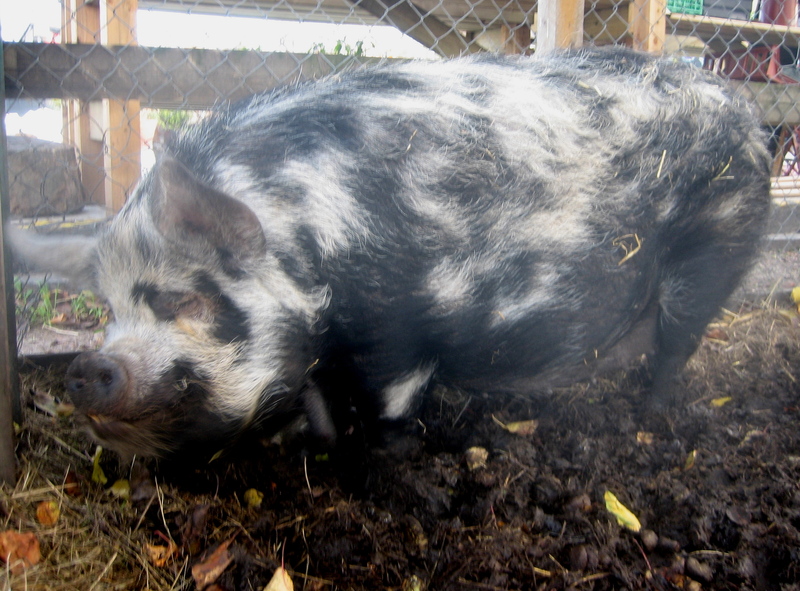 The name Kune-Kune means “fat and round” in Maori, and is Polynesian for “plump” too, hinting at the breed’s earliest origins. Itchy had weight issues on account of all the delicious scraps brought to her by the adoring residents of Spitalfields. But thanks to Jenny Bettenson, the farmyard co-ordinator, Itchy is now on a strict regime of no snacks between meals and has slimmed down radically over the last three years. No “spanx” are necessary to support and lift Itchy’s nether regions. Kune-Kune pigs are a relatively small variety but Itchy has exceeded expectations by growing tall, which caused her some painful shoulder problems in the heavy snow of last winter. However, Itchy has a cosy sty to snuggle up in at night and after a month’s bed rest she was as right as rain. The distinguishing characteristic of the Kune-Kune breed are a pair of tassels or “Piri-Piri” which hang from the lower jaw as an evolutionary curiousity and, as you will see, Itchy has a fine pair dangling. I hope Itchy will forgive me if I reveal her age, which is approaching ten years old, with a birthday coming up on the 4th January 2010. This is a mature age, verging on old for a pig, that may live up to fifteen years. Many readers will remember Itchy’s sister Scratchy who sadly passed away in 2005, but Jenny assures me that Itchy is not lonely on account of her many visitors, especially children, drawn by her gentle nature and endearing traits. You only have to rub Itchy’s belly and she will roll over on her back in playful affection and if you offer a treat, she will sit up and beg eagerly. 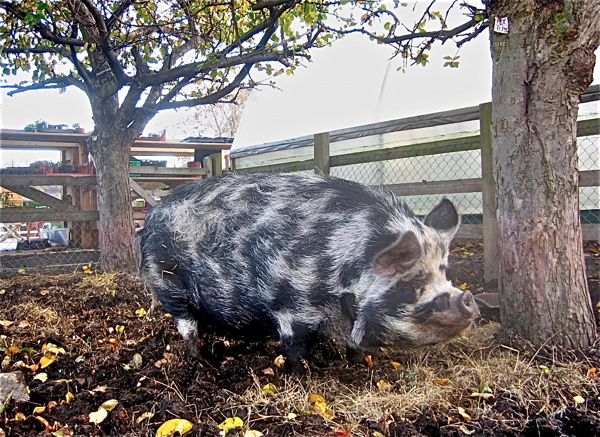 Since the loss of Scratchy in 2005, Itchy had a new batchelorette pad constructed with a peaceful run under the apple trees at the city farm and she is at home to visitors most days – if you fancy dropping by to say hello, as I always do whenever I am passing. Given the usual fate of pigs, it is an extraordinary privileged existence that Itchy enjoys, though in her innocence she will never know it. Everyone in Spitalfields loves the old sow. Priceless! Thank you gentle author. You have given us a whole new perspective on pig. Nice to find your great blog. In August I was in London for the first time and had accommodation in the East End. I have to come back soon and visit Itchy, Leila’s shop, St. John Bread & Wine and some other remarkable people, animals and places you will introduce in the next ten thousand posts .